Electric fencing is very popular as it is one of the cheapest deer fencing options available. Unlike other fencing methods, it is less of a barrier than it is a training tool. Electric fencing systems use baited line and lures to encourage deer to come toward the fence, delivering a shock when the animal investigates the line too closely. This system’s effectiveness relies on a deer’s memory of unpleasant shocks after repeated visits to the area, subsequently conditioning the deer not to come back to the fence. A determined deer or frightened deer, however, will breach this fence without much of a problem. Electric fences are typically low to the ground, so a deer might have less trouble jumping over it than a taller type of fence. It may also go under or through the fence if it is willing to withstand a shock. Electric fences are also higher maintenance than other options, and are unsafe if installed in an area where children and pets may wander. While a cost-effective and easily installed option for areas with low traffic, it may not be the best for a garden experiencing a higher level of deer pressure. With proper maintenance of electronic components, an electric fence installation should last indefinitely. chewing. Poly fence is lightweight and easy to install, even at heights of six to eight feet. It is staked into the ground to prevent digging at the bottom, and tall enough to deter jumping. Overall, it is a much more effective barrier than electric fence. Another advantage to this type of fence is that from even short distances, poly fence appears invisible against the landscape. Poly fence is more expensive than electric fence, but is still cheaper than more traditional steel and wire fencing. 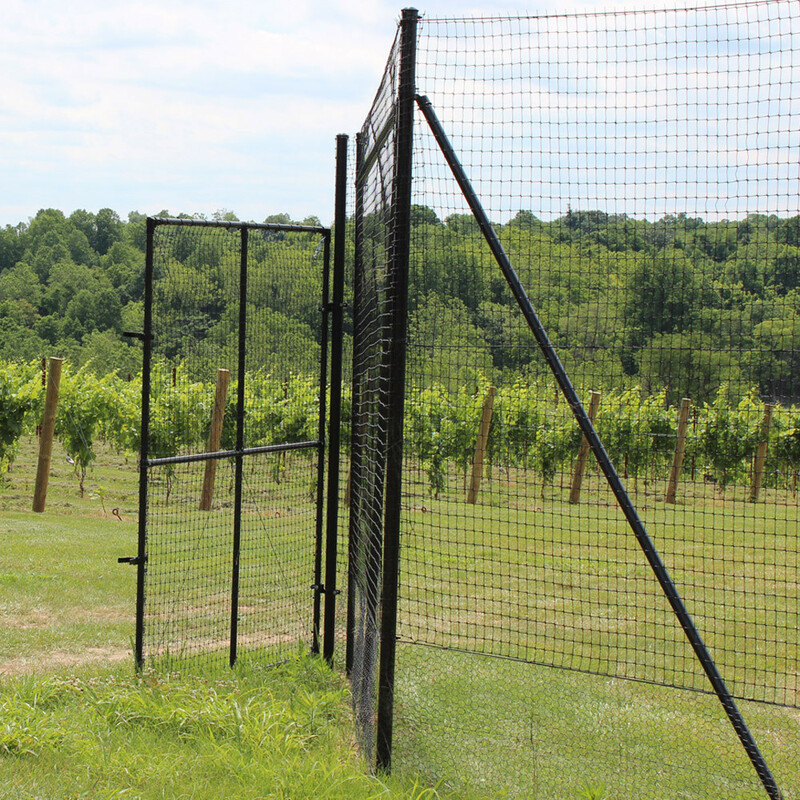 Unlike steel fencing, it is not 100% chew proof, and with high enough deer pressure and consistent chewing, holes or tearing may occur over time. Depending on which strength of fence is used in an installation, poly deer fencing has a life expectancy of about ten to twenty years. For a successful installation, DeerBusters recommends that a poly deer fence be at least 7.5' feet high. the galvanized steel means it is chew proof. It is PVC coated to withstand weather damage, and like the poly fence, it becomes invisible at short distances and does not upset the look of the landscape. Naturally, this fence is meant to be a more permanent installation, and that installation can be trickier than with a poly or electric fence. With proper installation, a steel hex fence should last between twenty and thirty years. Fixed knot fence is another wire mesh made of galvanized steel, but its strength is derived from the knots for which it’s named. To prevent stretching and shifting in the wires, another wire is twisted around the intersections in the mesh, holding each wire in place. The introduction of that wire, as well as class three galvanization and a zinc-aluminum coating make fixed knot fence some of the strongest fencing available. It resists corrosion and elemental damage, and it is completely chew proof, making it an ideal fence for farm and livestock usage. The longevity of fixed wire fence is about twenty to forty years. Unfortunately, while it is the strongest fencing available, it is more expensive than non-metal fencing. With the strength of this fence also comes difficulty of installation. Those who are not experienced in installing fences will likely have to obtain professional help to set it up correctly.